Frank Cho working on the cover art for Ballpoint Beauties. I’m back in the office after a productive week spent in Baltimore, Maryland. I was on the east coast for two reasons; I was there to exhibit at Baltimore Comic-Con and to meet with Frank Cho to go over his next two books that I will be publishing. 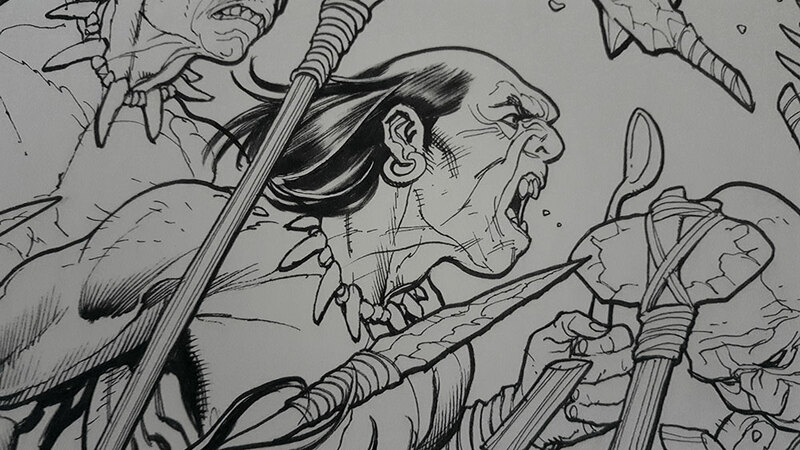 Detail from Frank Cho’s original art from his Savage Wolverine run. I arrived on Wednesday evening (September 26th) at Frank Cho’s house when we immediately began working on his books. The first book is his Ballpoint Beauties title that collects his ballpoint drawings. We’re including step-by-step sections and he is writing some text for the book so that people can see how he works. The second book on Cho will be announced next year sometime. Frank is such a busy guy who is oftentimes stretched in multiple directions. Because of this I typically prefer to keep our projects together quiet until they are about 80% completed to make sure I am not introducing any stress into Frank’s schedule. At the moment, our full focus is on Ballpoint Beauties. However, I did get a large chunk of work done on the unannounced book during my visits to Frank’s house. I spent hours pouring through his originals and scanning material. We will launch a Kickstarter campaign for his Ballpoint Beauties book on Tuesday, October 16th. 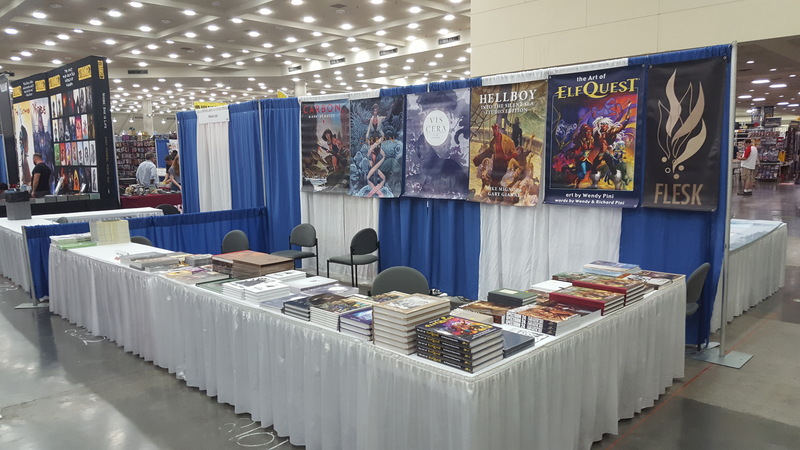 The Flesk booth at Baltimore Comic Con an hour before opening on the first day. The Baltimore Comic Con was terrific this year. It generally is every year, but this one was especially successful. Richard and Wendy Pini had a booth directly across from us. Frank Cho was next to us and Mark Schultz was with us. Arthur Adams and Joyce Chin were just a few aisles away. Having all these artists present who I work with fueled the interest in their books. As a result, we sold almost all the books that we brought to the show. Since this was only the second show where I exhibited this year, and the first where I sat behind the booth and worked, I found that it took me a full day to find my voice. I didn’t realize how out of practice I was when it comes to talking to different people all throughout the day. On Saturday we were totally slammed with people stopping by, and by Sunday I finally got into a pretty good groove when chatting with people who stopped by. Richard and Wendy Pini’s booth directly across from ours. Each day I enjoyed interacting with Richard and Wendy. Having dinners with various artists and con friends was also nice. I had lost my voice by Saturday evening and hardly spoke during dinner, but found it again for Sunday morning, fortunately. 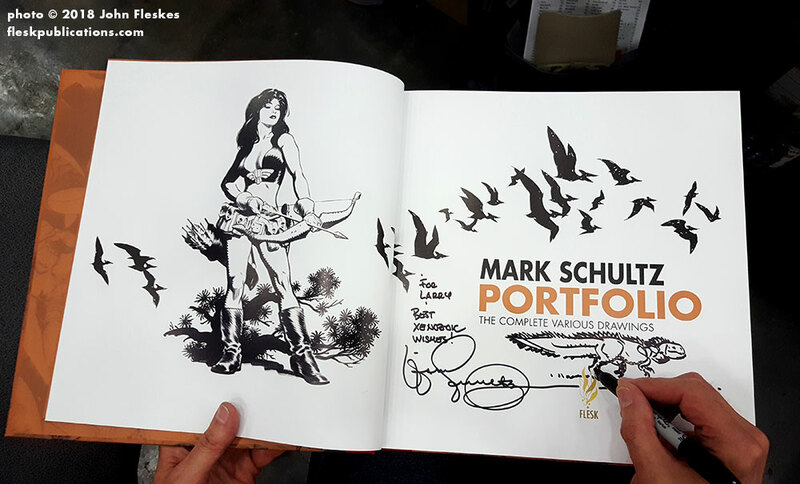 Mark Schultz signing a copy of his Portfolio book. I managed to walk the floor on Sunday. 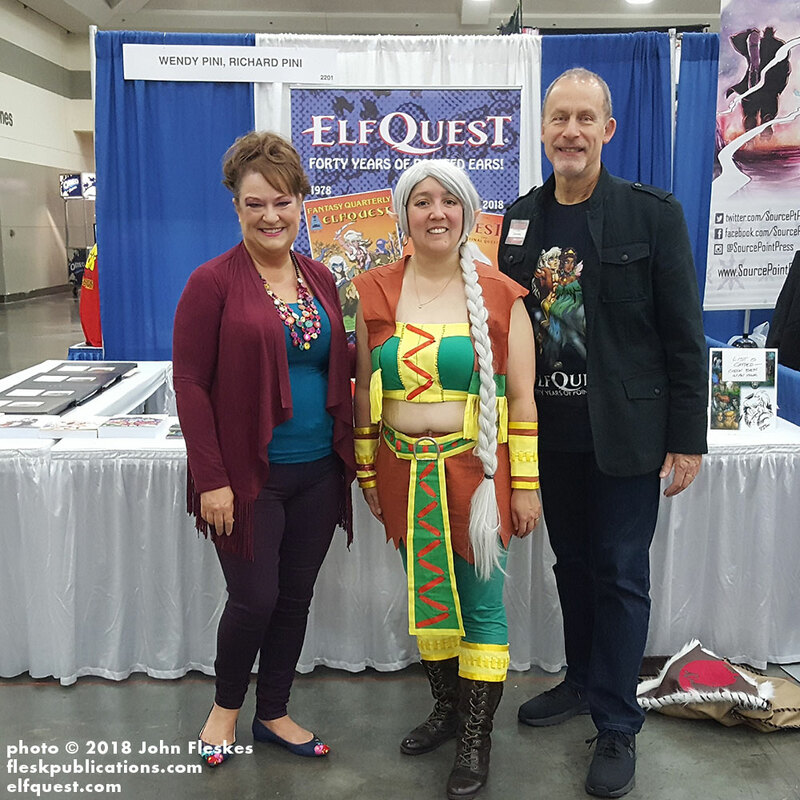 Baltimore Comic Con is a great show for me, primarily because the show organizers and volunteers treat us well, plus the attendees are well informed and sophisticated collectors who know their artists and writers. Additionally, they bring in legendary artists as guests who are a joy to meet. It’s truly a “comic” show and not one of those events that appropriates the name for alternative pop culture purposes. 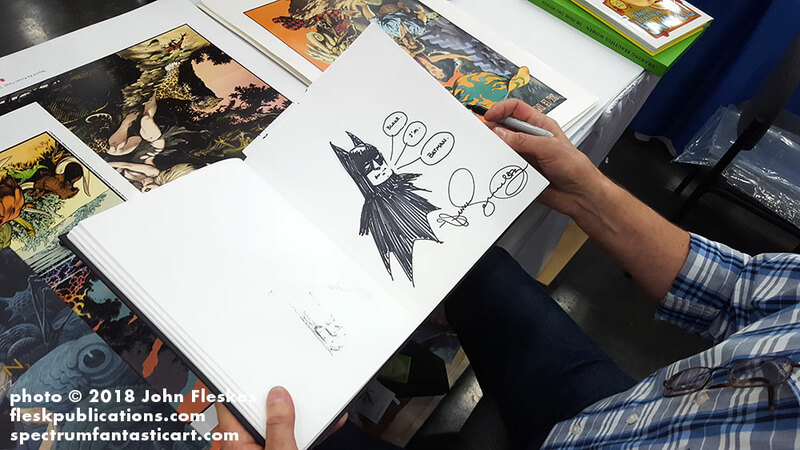 Mark Schultz doing a Batman sketch for a young fan. I was amazed at how many people stopped by who knew who we were and who visited simply to express how much they enjoy our books. I also appreciated the feedback about how much people like our Kickstarter campaigns. I had several people comment on how our cover prices are affordable. 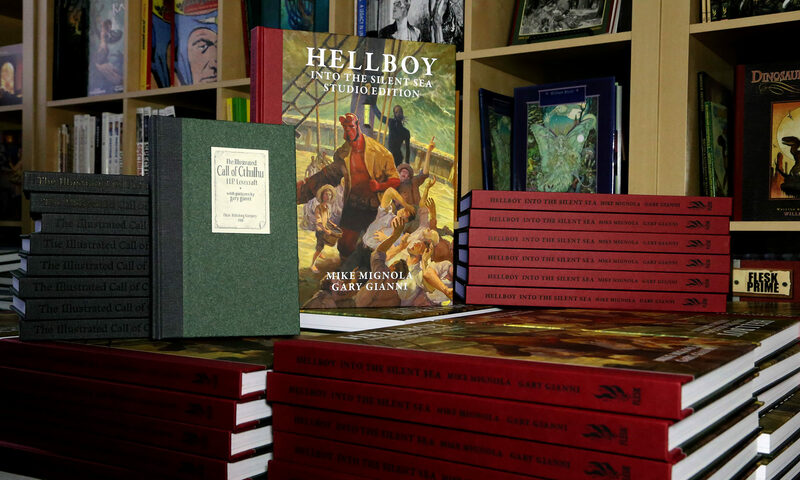 This is intentional on my part since I didn’t grow up with money and I’m sensitive to keeping the books as affordable as possible for the students and for the working man and woman. 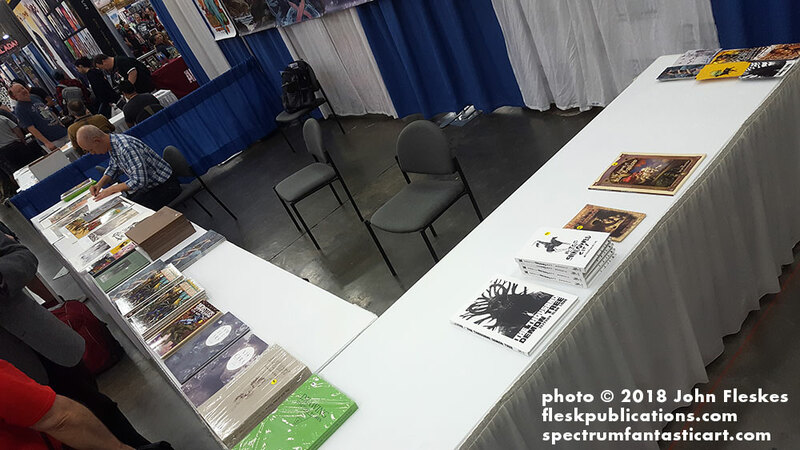 Our Flesk booth an hour before closing on the last day of Baltimore Comic Con. We sold most of the books that we brought! It was a productive week. I’m back to working on books and I look forward to continuing to bring you more titles for as long as you will support us. Thanks, as always.